Allowing on street parking at Surfside and the next "Meet George"
Everyone loves Surfside Park and Beach. 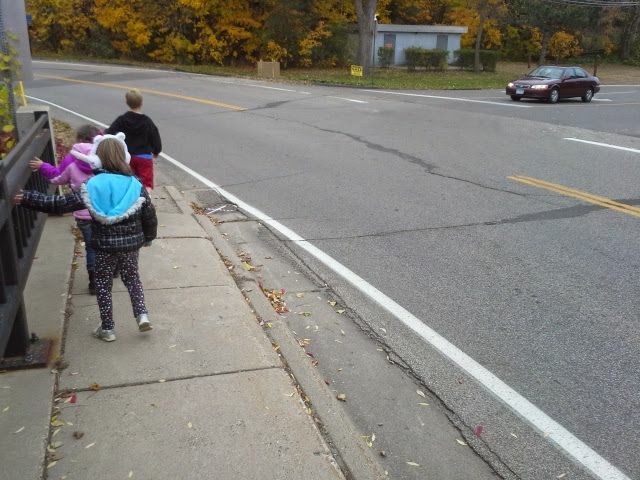 It's on a great location on Lake Minnetonka, relatively close to downtown Mound. It's got great features like the swimming beach, boat docks, volleyball court, playground, picnic tables, grills, the depot for indoor events and finally it has a bike rack! It's also a great place for events. Several churches in the area will hold a Sunday service at the beach, it is regularly a place for family events, and you shouldn't miss the Music in the Park series there during the summer. I've written about this issue before about this park and the lack of on street parking. Around 1990, the city council decided to ask Hennepin County to post no parking signs. This needs to be fixed, and post "No Boat Trailer Parking" signs, and make Surfside a better, more accessible place. On street parking at Surfside. A simple way to improve a "place" in Mound. I made this video two years ago and still remains true today. Also, come and visit me one of the next three evenings in our city parks. I'd love to meet you! The kids and I had fun at Swenson Park last Saturday morning, getting a great sense of the neighborhoods and some of the best places Mound has to offer. 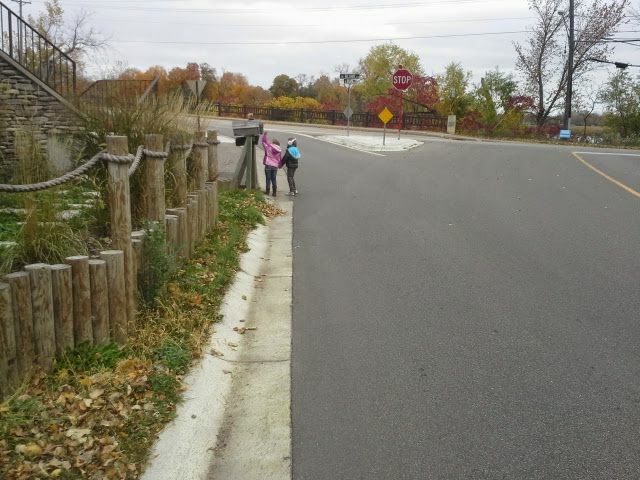 Here are some pictures of our walk to the park. 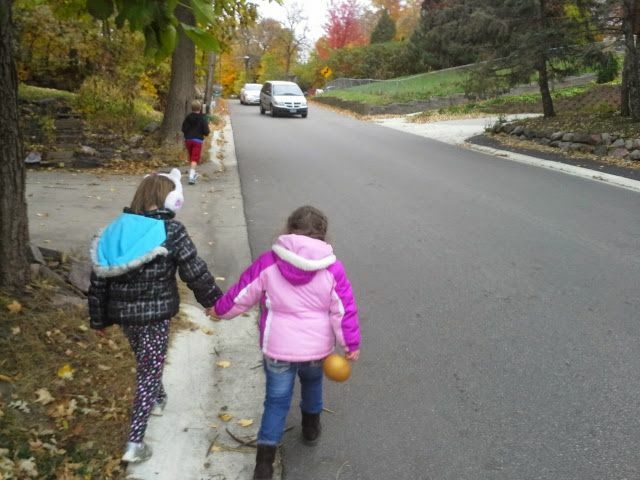 Our walk to the park started on Emerald Dr, a nice, walkable street. 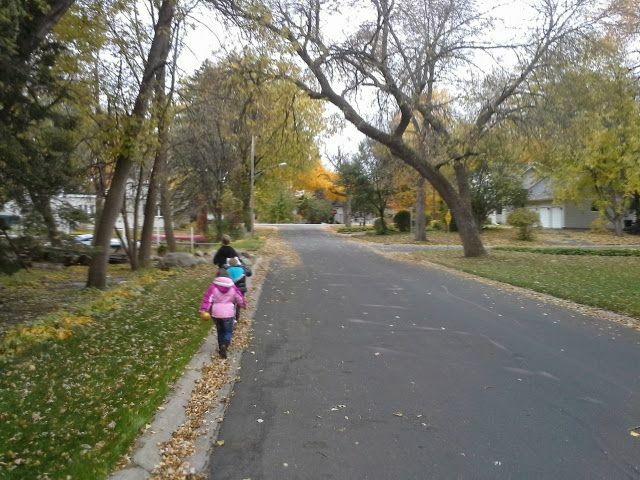 The kids really enjoyed stomping through the leaves on that beautiful Saturday. Coming up to the Wilshire/Brighton Blvd intersection. The Wilshire/Brighton Blvd intersection is not a very pleasant place to be... I've written about it before. We remained undaunted, and continued our way to the park. 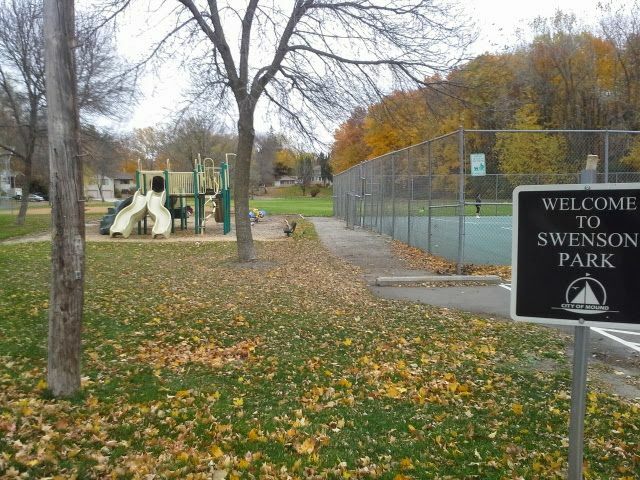 Swenson Park is a great place in Mound! Swenson Park on the Island is a great place for people. It's got a playground, tennis courts, softball field, basketball court, and a lovely little wooded area. The kids spent most of their time playing (and a little bit fighting) of course. 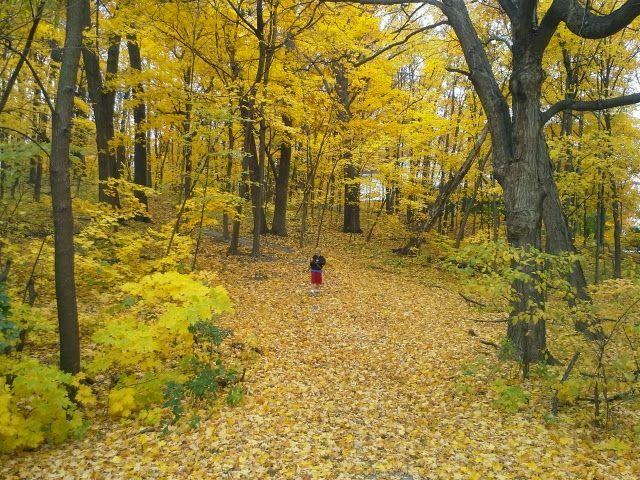 My daughter exploring the wooded area of Swenson Park. I have to say that this was the first park I've noticed (aside from Avon Park where I live) where the "No Parking" signs were on the side of the street by the houses, leaving plenty of room for parking on the park side of the street. I visited with one of the long time residents, and he said that the neighborhood petitioned the city to make that change long ago. 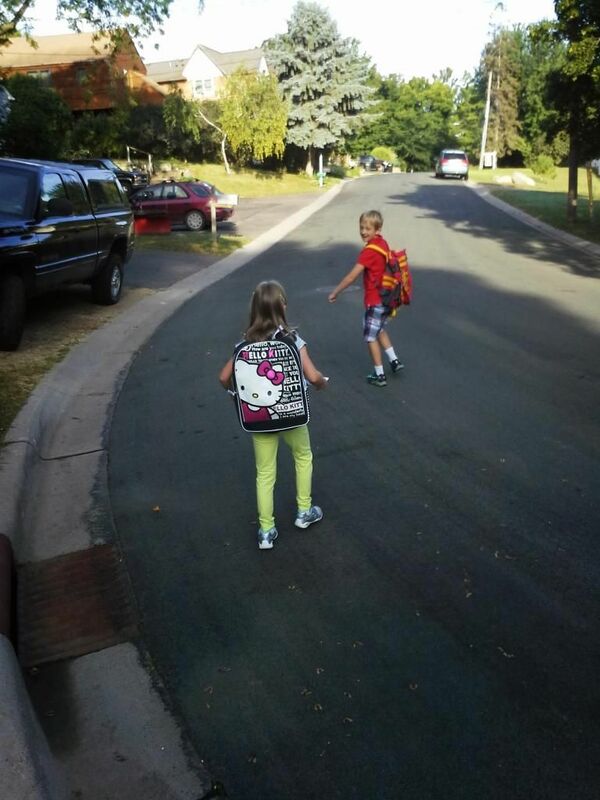 Way to go Swenson Park neighborhood! One really gets a good sense of what makes a "place" in a city when you are moving on foot. You see all the homes and places, streets and retaining walls, gardens and yards you miss otherwise. You run into friends and acquaintances and pet puppies, and wave to people who are raking leaves. After a while I start feeling sad for those who never take the time for activities like this. We enjoyed the park for a good hour, and we headed home. Wilshire/Brighton intersection again going the other way. The picture above of two girls simply walking home on the only place on the street they can, and are expected to share this space with speeding cars is a reminder that there is still work to undertake to improve Mound for people. Neighborhood connections like those between the Shirley Hills and the Island neighborhoods have been engineered to eliminate people so cars can save seconds from a commute. This mentality needs to change. Places like this need to be designed more thoughtfully, concentrating on enhancing the area for people to live and conduct their affairs on, while still allowing cars to respectfully drive through. We enjoyed our time at Swenson Park so much. that we are heading to other Mound parks in your neighborhood. Come and and say hi! I have been enlightened and enriched over the years having great conversations with you here online, and in the streets about our city. I am constantly humbled when people recognize the value of the arguments we've made at a Place in Mound. The fact is that many of the issues we see here in Mound are issues cities all over Minnesota and our country face. This is the beginning of a long and much larger process to create communities of value and enhance the lives we live in important, and meaningful ways. On this Saturday morning, October 18, from 10 to 11 in the morning, I'll be hanging out on the Island at Swenson Park with my kids playing soccer. It would be great to meet you if you are in the Brighton Blvd area, so come out and join us. I have been surprise how many people with whom I've barely know, offering me financial support. If you are interested in donating to my campaign for Mound Council member, you can use the link below. Thank you. See you Saturday. 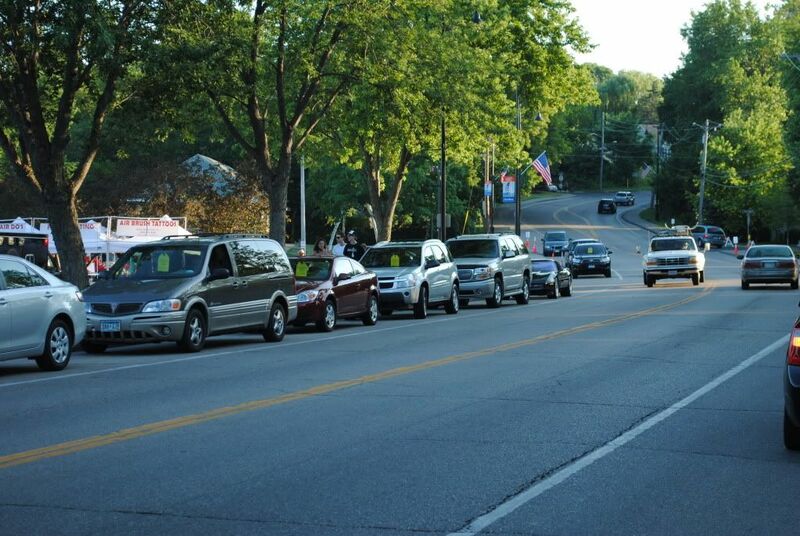 Let's work together to make Mound a place to drive to, not drive through.